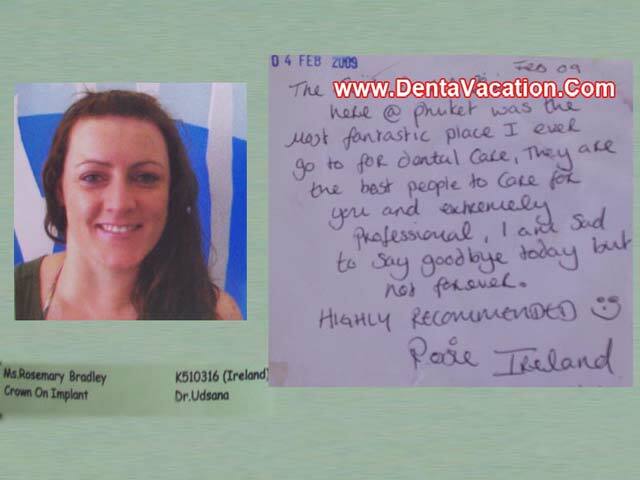 Rosemary Bradley, an Irish, chose to travel to Patong, Phuket in Thailand to get her dental work. Rosemary’s dental job comprised getting dental crown on implant. The dental clinic, located in the Patong beach area of Phuket, receives a number of international patients each year. One of the highlights of the clinic is its in-house well-equipped clinic which is ISO 9001:2008 certified. With its modern technology and highly competent English-speaking staff, the clinic has garnered a large number of positive customer testimonials and feedback. Here is another such feedback, in which Ywes Latuszweski from France reviews getting dental crowns in Phuket. For more information and reviews, fill in the free quote-request form on the right.